Between the yet-to-be-released Pebble and the yet-to-be-announced Apple iWatch, smart watches – that is, miniaturized computers you wear on your wrist – are the hottest pieces of technology that no one is really using yet. Not wanting to be left out of this Fall’s possible smart watch rush, Sony has announced the SmartWatch 2, the follow-up to the company’s moderately well-received first-generation SmartWatch. Naturally, the Sony SmartWatch 2 does more than just tell time. It connects directly to your Android smartphone via Bluetooth, notifying through subtle vibrations you if you’ve missed a call, gotten an important text message or a new friend request on Facebook. It’s like a smaller, more discrete version of your phone that can keep you up to date even when your phone is stashed away, like when you’re at a crowded movie theater. Just be sure to leave the theater first before you start answering calls, though – some of us are actually trying to watch Fast & Furious 6 and don’t need you distracting us from the complex plot, thank you very much. The screen of the SmartWatch 2 measures 1.6 inches, offering 220 x 176 pixels worth of full color goodness. According to Sony, it also has better battery life than the original SmartWatch, and it’s easier to see in direct sunlight. One major drawback to the SmartWatch 2 is that it’s only compatible with Android devices – if you have an iPhone, it simply won’t connect. Apple fans are not entirely without options, however: The $129.99 COOKOO smart watch is an iOS-only device, and the competing $150.00 Pebble smart watch will work with both iOS and Android. And, of course, there are plenty of specialty watchbands for the iPod nano that essentially let you build your own smart watch. 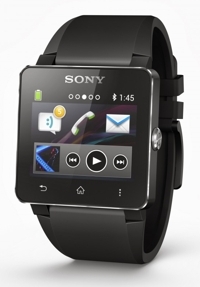 The Sony SmartWatch 2 will go on sale this September. Its price has yet to be announced.